In iTunes 11.1.4, Apple made it a lot easier to work with your Wish List, that virtual shopping cart where you can store items you want to buy in the future. 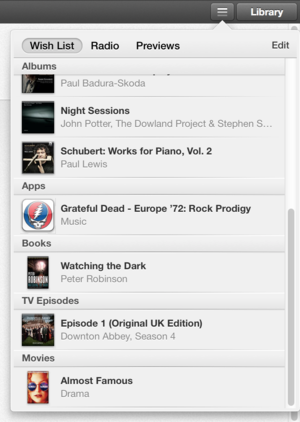 That list had been available before from the iTunes Store, but now you can view it from your iTunes media library. 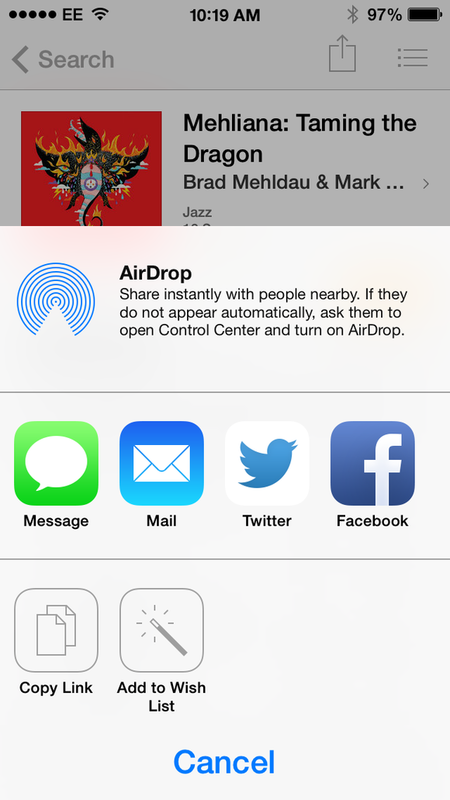 Here’s how you can use it to manage all kinds of purchases from the iTunes Store. With all the different kinds of digital content you can now purchase through iTunes, it can be hard to remember what you want to buy: hence the Wish List. Anything you can buy via the iTunes Store, including music, movies, iOS apps, and audiobooks, you can save in your Wish List. You can not, however, add apps from the Mac App Store (at least not yet). Adding to the Wish List from iOS. To add an item to the Wish List, you just find something you want to buy in the store, open the drop-down showing its price, then choose Add to Wish List. For some reason, you can’t add free items (apps or TV shows, say) to the Wish List, even though that’d be useful for those times when you don’t have the bandwidth to download something, but want to save them for later. But you can add any paid content. Adding items to the list from an iOS device is a bit different: When you’re viewing an item, tap the Share button (the box with the arrow at the top of the window), then tap Add to Wish List. Once you’ve built up your Wish List, you can check it out at any time. In iTunes, look for the button with three horizontal lines located at the upper right corner of the iTunes window, in either the iTunes Store or in your library. On iOS devices, you’ll also see a Wish List button in the App Store and iTunes Store apps. You can buy any of the items in your Wish List, or you can just preview them again. The Wish List aggregates everything you've previewed, listened to, and wished for from the iTunes Store and App Store. The Wish List tab shows what you’ve put aside by category: Apps, Books, Music, and so on. But the Previews section groups everything together by date, in reverse chronological order. Naturally, the Wish List is designed to help you spend money. Just hover your cursor over an item (or tap it on an iOS device) to view it in Apple’s store. You can then buy the item (or rent it, if it’s a movie and it’s available for rental). If your Wish List gets too long and unwieldy, you can always edit it: click Edit, then check the boxes next to any items you want to remove. Click Delete to get rid of them. It’s easy for the Previews section of the Wish List to get too long, too. To remedy that, click Clear to start over with a clean slate. You can easily add any items from the Previews list to the Wish List: As in the iTunes Store, just hover your cursor over an item, click the arrow button, and choose Add to Wish List. One thing the Wish List is missing is a Buy All button. Imagine you’ve spent time in the iTunes Store, compiling a Wish List filled with songs you want to use to make a new playlist. If you want to buy them, you need to click the Buy button for each one; this can take a while if you have a lot of items. Even though the Wish List is available from the special buttons I showed you earlier, you can still access the Wish List from links in the iTunes Store; the presentation there, with all the items on a single page, can be easier to use. 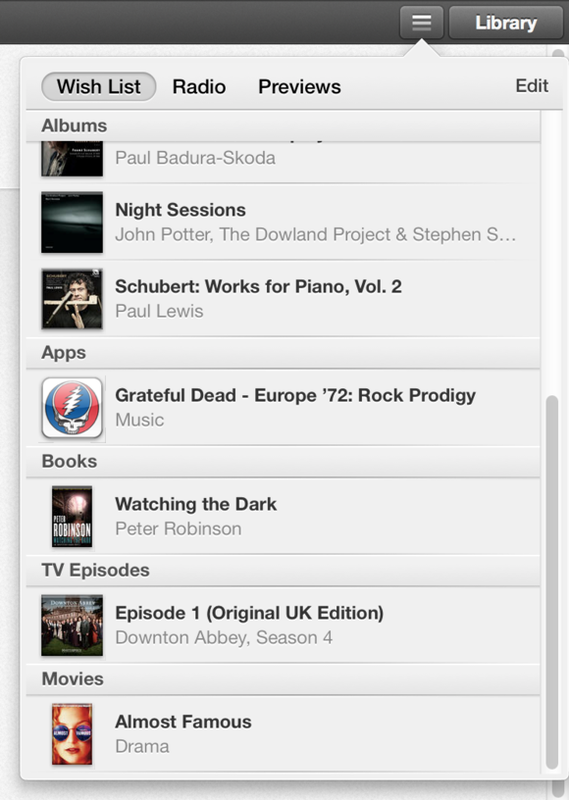 In the Quick Links section on any main page in the iTunes Store, just click My Wish List. Or you can click on your user name in the upper left corner; a drop-down should appear with My Wish List as one of the choices. 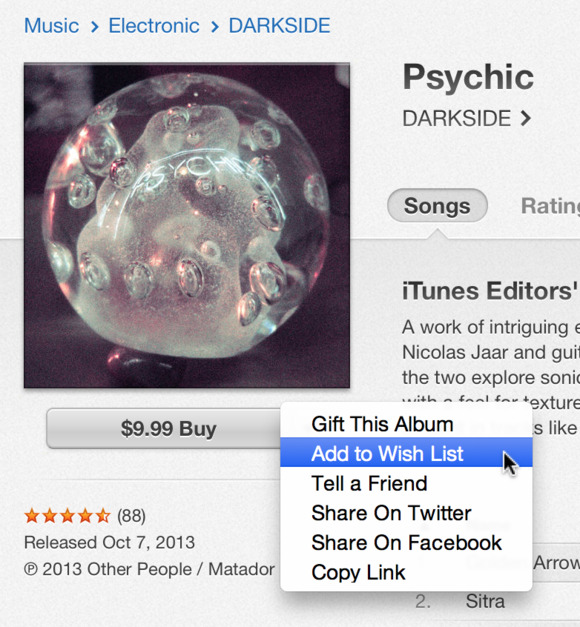 Or, from the footer of an iTunes Store page, in the Manage section, click My Wish List. Note that this version of the Wish List doesn’t previews or music you’ve listened to on iTunes Radio. The Wish List can be a bit inconsistent. You can add books to it from the iTunes Store, yet you cannot view it in iBooks on iOS (you can in the OS X iBooks app, under Quick Links, or in page footers). And, sometimes, music I’ve listened to on iTunes Radio shows up in Previews. It might be useful if your Wish List was visible to others, so they could buy you music, movies, books or apps; Amazon does this, and you can create multiple Wish Lists there, choosing whether they are public or private. Still, the iTunes Wish List is a useful way to keep track of things you want to buy and things you’ve checked out recently. That makes it an excellent tool for making store purchasing a lot easier.